Properties in Kaprun average 4.5 out of 5 stars. 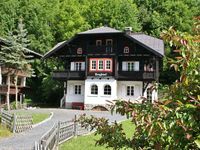 Property 5: Beautiful villa at just 400 m from the lake of Zell am See. We have been coming to Zell am See for over 10 years and it never fails to disappoint. The town is clean with lots of places to eat and drink and far too many activities and places to visit in a week. We even went sledging on the glacier in Aug! The only negative is that as this is the second year we stayed at the Villa we have seen a drop in the standards. The carpets are very stained with it looks like chewing gum on some of the bed room carpets. All of the showers were broken and the trays flooded. The shower head fell off several times in one room hitting me on the head and dropping heavily on my feet. This also happened in my sons shower hitting him quite hard. I did report this twice verbally and by email but nothing was done. We also had to sort the rubbish left outside as it was attracting flys and had to give the outside a good sweep to remove litter and fag butts. It's such a shame as the house is so nice and could be luxurious. All beds were o my given 1 pillow which I though was a bit tight as we pay 10 euro per person bedding fee and also only 1 small towel. It has made us wonder whether to book next year. On the whole it's a fab house in a great location but with maintenance issues that would take very little effort to rectify.